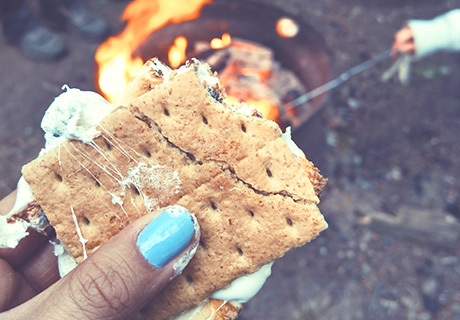 The classic combination of chocolate, marshmallow and graham cracker is delectable, but here’s a couple ways to make your treat s’more mouthwatering – see what we did there? What’s crispy and warm, and easily made? That’s right, a fire pit bonfire! Did you think we were going to say s’mores? Well, those are definitely crispy and warm, too, but they’re also gooey, mouthwatering, chocolatey – do we really need to keep going? These creative takes on the classic s’more recipe will have guests asking for s’more long after the bonfire burns out – we did it again! All these years and we never thought to combine the two most comforting home-baked treats: cookies and s’mores. If graham crackers are getting a little too dull for your taste buds, replace them with cookies to make it even sweeter. If you really want to give your taste buds a sugar rush, try this S’more Stuffed Chocolate Chip Cookies recipe from Clear 99 that combines the s’more and chocolate chip cookie for an extra sweet treat. Asking excited party goers to sit down and eat can be a difficult task for some hosts. If your guests prefer to mingle and chat with other guests, a toasty grab-and-go is the perfect conversation starter. Try Five Heart Home’s S’more Dip recipe for some marshmallowy, gooey goodness. Sometimes, you might want to put a spin on classic treats to spice things up. Mix it up by making some s’more truffles and s’more cupcakes. If you’re looking to make classic s’mores, but add a little something extra, try some of the The Kitchn’s 12 Creative S’mores For A Party that use all the traditional ingredients of a s’more while combining new flavors such as bacon for the Salty Caramel Bacon S’more and mint chocolate for the Grasshopper Mint S’more. You don’t have to be a kid to enjoy s’mores, especially not this S’more Martini. Mix up a couple of these for all your adult bonfire guests and they will definitely not hesitate to accept the invitation to your next backyard party. What’s your favorite s’more topping? What else do you like to eat during bonfire parties? Do you have a s’more recipe to share? Tell us about it in a comment below!